Which is the most popular membership? Which membership saves you the most money? The platinum membership is great for people that rent equipment and have their own equipment. 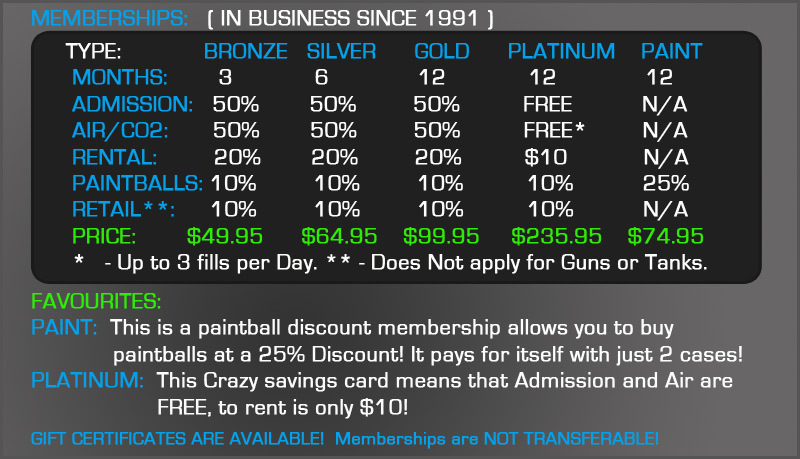 The PAINT membership is the best savings for regular players as it takes a 25% chunk off of any paintball purchases. The Platinum membership only costs $235, and can pay for itself in only 11 visits for a regular paintball player with their own equipment. Can I use these memberships for other people in our Group? Memberships are only valid for the members only. So for example, a person with the PAINT membership can only buy paint for himself to use. We also give PAINT members a special wristband for identification and also a different type of paintballs for PAINT members only. Can Memberships be used in Combination with the PAINT Discount Membership? Yes. For even bigger savings, any of the memberships can be used along with the PAINT discount membership to achieve up to 25% savings on paintballs! What Orlando Paintball goes out of business? This is a fair question, especially as you see so many gyms, and paintball places go out of business. For this reason, it is important to get a membership from a reputable business that has a good history and reputation. Orlando Paintball has been in business longer than any other paintball facility in Florida. It has been open since 1991, yet is on the leading edge and is considered a benchmark in the paintball industry. This should give you some assurance of this company and purchasing a membership. Will the prices or privilidges of a Membership change? Once you buy a Membership, your price for that membership is locked in and its privilidges will never change. Any membership grandfathers its plan and pricing so if anything changes in the future, you have full rights to renewal with the same price and privilidges in the future as long as you renew your membership without any lapse of time.